Data mining – in other words doing astronomy using existing data in public repositories: examples from galactic and extragalactic astrophysics; an introduction to TopCat from its author (Mark Taylor); practical exercises. Citizen science – how to get the general public to do your data analysis for you: examples and exercises. Analysing observational data – an introduction to the main concepts: examples and practical exercises of source extraction, photometry, spectroscopy, SED fitting, etc. Register here. Deadline to register is 2 February 2018. Numerical Modelling in Condensed Matter Workshop a success! 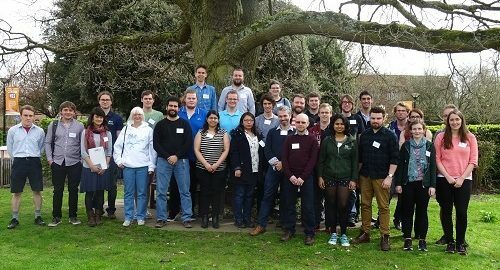 The Numerical Modelling in Condensed Matter Workshop took place on 14-16 January 2018 at Old Thorns in Liphook and was attended by 20 delegates. The students enjoyed the hands-on practical sessions on the simulation programme and the interaction with other SEPnet PGRs. Thanks to Dr Dave Faux, University of Surrey and Professor Keith Refson who delivered the 3-day workshop and to Cristobel Soares-Smith who organised the event. Who: Postgraduate and postdoctoral researchers from the SEPnet region with research interests in this year’s conference topics. A limited number of places are available to early stage researchers beyond the region. This conference aims to bring together students from all areas of astronomy research. From micrometeorites at Kent, to cosmological surveys at Portsmouth, the GRADnet groups and astronomy departments cover all sizes and scales of the Universe. Students will gain knowledge of a wide range of research techniques applied to the various size scales, and see where such techniques may cross over and enhance their own research; e.g. how the physics of planetary system formation can scale up to galactic formation. The parallel conference is Advances in High Energy Physics and Cosmology and aims to bring together students from all areas of particle physics research. There will be cross-over lectures which are relevant to students of both astronomy and particle physics. The deadline to register is 7 February 2018. Register here. Who: Postgraduate and postdoctoral researchers from the SEPnet region with research interests in this year’s conference topics. A limited number of places are available to early stage researchers beyond the region.What: Two parallel research conferences proposed and organised by students wanting to advance their research and extend their collaborations. The conferences include talks by invited speakers and students as well as poster and recreational sessions. This conference aims to bring together students from all GRADnet nodes and provide high quality lectures from experts in the fields over a variety of topics. Students attending will learn from a wide range of topics, which include dark matter, gravitational waves and other cosmological topics. There will also be sessions for students to present their own research in addition to learning from accomplished lecturers. Organisers: Simon King, University of Southampton, Sonali Mohapatra and Jack Setford, University of Sussex. The parallel conference is From Micrometres to Megaparsecs and aims to bring together students from all areas of astronomy research. There will be cross-over lectures which are relevant to students of both particle physics and astronomy. Thinking about how to commercialise your research, or an idea, and turn it into a product or service? Perhaps you are interested in a career in business or knowing how businesses are created. Would you like to start thinking like an entrepreneur? Or as someone that wants to change the world through innovation. In this workshop you will learn and practise some real business thinking. We’ll introduce you to a modern and practical tool-set for evaluating new business ideas and innovations and help you get off the starting block. Book your place at Eventbrite via these links: Sussex and QMUL. The same workshop is taking place on both days, so come along to the one most convenient for you. PGR students from any SEPnet department are welcome. Julia spent the first 15 years of her career managing products – at one end of the scale generating new revenues of £1m per annum for a start-up and at the other managing a product portfolio of £350m per annum in Corporate. In 2006 she set up independently as Product Doctor providing user and revenue-centric product coaching for innovators – often helping them to apply tried and tested toolkits to make successful products. She runs courses at UCL, coaches at Pearson Education and has worked with many funded start-ups including Fitbug.